Business Process Management (BPM) has emerged as one of the abiding systematic management approaches in order to design, execute and govern organizational business processes. Traditionally, most attention within the BPM community has been given to studying control-flow aspects, without taking other contextual aspects into account. This paper contributes to the existing body of work by focusing on the particular context of geospatial information. We argue that explicitly taking this context into consideration in the modeling and execution of business processes can contribute to improve their effectiveness and efficiency. 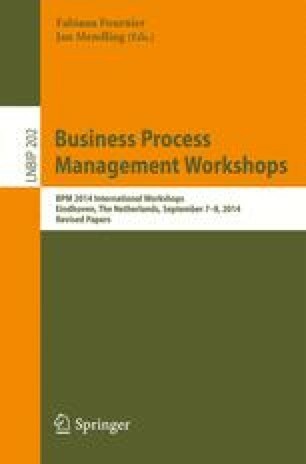 As such, the goal of this paper is to make the modeling and execution aspects of BPM location-aware. We do so by proposing a Petri net modeling extension which is formalized by means of a mapping to coloured Petri nets. Our approach has been implemented using CPN Tools and a simulation extension was developed to support the execution and validation of location-aware process models. We also illustrate the feasibility of coupling business process support systems with geographical information systems by means of an experimental case setup. This work is supported by the National Key Technology R&D Program, China (grant 2012BAH01F02), by the KU Leuven research council (grant OT/10/010) and the Flemish Research Council (Odysseus grant B.0915.09).